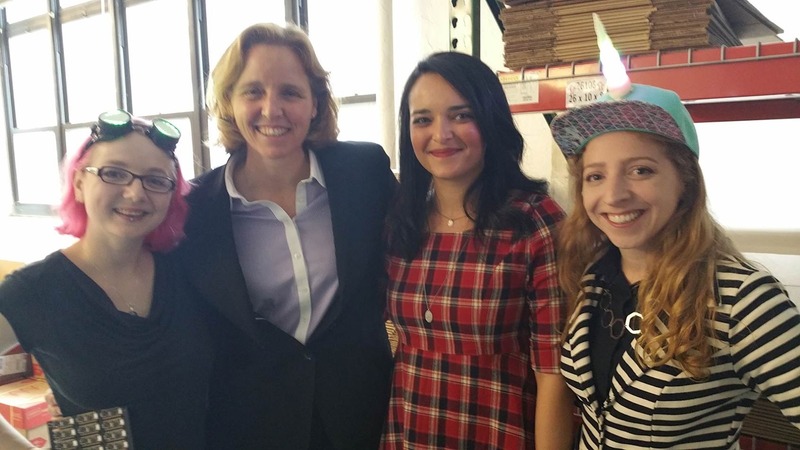 @WhiteHouseOSTP visited @adafruit for #MFGDAY15 @USCTO @megbrewster @bekathwia @jesscalifano @makerswomen « Adafruit Industries – Makers, hackers, artists, designers and engineers! We had some visitors for Manufacturing Day 2015! Thank you so much for coming by! megan j. smith is the chief technology officer of the united states. she was previously a vice president of google[x] at google, was vice president of business development at google for nine years, and was general manager of google.org and the former ceo of planet out, an entertainment company focused on lgbt communities. she serves on the boards of mit and vital voices, is a member of the usaid advisory committee on voluntary aid and co-founded the malala fund. on september 4, 2014, she was named as the third (and first female) chief technology officer of the united states, succeeding todd park. senior policy advisor, advanced manufacturing – megan brewster, dr. megan brewster is a materials scientist and engineer with energy policy experience. dr. brewster currently serves as a fellow of the american association for the advancement of science at the advanced manufacturing office within the department of energy. prior to her current appointment, dr. brewster served as a science and technology congressional fellow on the senate committee on energy and natural resources, handling portfolio issue areas such as critical minerals, advanced manufacturing, methane emissions, and the energy-water nexus. dr. brewster previously worked as a materials scientist at ge global research, where she supported the ge durathon battery start-up by investigating degradation mechanisms and developing next-generation chemistries. dr. brewster earned her ph.d. from the massachusetts institute of technology and her b.s from the university of washington, both in materials science and engineering, as well as a ph.d. minor in technology and public policy from mit. puneet ahira serves as a special advisor to megan smith – u.s. chief technology officer and assistant to president obama. the scope of puneet’s role at the white house includes leveraging science & technology to: address connectivity deserts across america and abroad, counter violent extremism, expand opportunity for refugees and other marginalized communities, and scale the work of heroic women and men driving forward systems solutions. in her previous life in the private sector, puneet was the program director for solve for x at google[x] – google’s stealth moonshot laboratory focused on developing technologies that could positively impact billions of people. prior to her time at google, she worked as a portfolio analyst at goldman sachs, where she was part of the founding team that introduced a framework to identify structurally-advantaged companies poised to disrupt their industries over the next 15-20 years. she served on the board of directors for colin powell’s non-profit – america’s promise, co-founded an ngo called freedom’s answer, and co-authored a book on civic activism under the same title. puneet received her bsc and msc from oxford university. dyllan mcgee is a two-time emmy award-winning documentary filmmaker and founder of mcgee media. in partnership with peter kunhardt, mcgee produced “gloria: in her own words” (hbo), “finding your roots with henry louis gates, jr.” (pbs), “makers: women who make america” and many more. mcgee is the founder and executive producer of aol’s makers, a digital and video story-telling platform that aims to be the largest video collection of women’s stories ever assembled. makers’ growing library of over 270 interviews with trailblazing women, both known, and unknown. her films include: emmy award-nominated documentary, gloria: in her own words (hbo), emmy and peabody award-winning the african americans: many rivers to cross (pbs); emmy award-winning teddy: in his own words (hbo); faces of america with henry louis gates, jr. (pbs); this emotional life (pbs); african american lives (pbs); oprah’s roots (pbs); and emmy-nominated in memoriam; 9/11/01 (hbo). mcgee was the founding executive director of the meserve kunhardt foundation and the gordon parks foundation. from 2003 to 2005 dyllan served as the director of content and operations for the international freedom center on ground zero in new york, a cultural institution that was proposed as part of the lower manhattan development corporation’s redevelopment of the world trade center site. mcgee is the recipient of many awards including two emmy awards, a dupont journalism award, a peabody award, the new york women in communications matrix award, and planned parenthood’s women of valor award. she also served on the board of directors for the taft school from 1997 to 2007. We’ll have more photos, videos and more soon! STAY TUNED!